Oh friends, this has been a long slog . . . even though it hasn't quite been four months, it feels a lot longer. Never, never let me overeat again. Please, Lord, let me be moderate in all things. It's not worth it, or needful, or even an act of gratitude, to overindulge in the good gifts we've been given. Nothing tastes as good as skinny healthy and fit feels. I feel ever so much better. I went into Target to get some "transition" jeans (because I'm not at my desired weight yet, and nothing fits), and it was the first time in years I didn't inwardly cringe seeing my backside in a three-way mirror. Every day for the past 15 years or so I have felt badly about my body. Every. day. Granted, most of the time it was just a fleeting thought, but it was there. I really don't want to deal with this anymore. Just some discipline every day, and I can do this. For the rest of my life. Would I rather exercise some discipline, or feel overweight, tired, and unhealthy? Seventeen more pounds to go. Or maybe a little less. We can't target the areas we want to slim down. I will always be a pear no matter how much weight I lose. And if my face starts collapsing ! !, I'll stop before my goal is reached. Here are a few things I've learned . . . Vegetables, lean protein, and a little fruit are my besties! They take such good care of me! A little good fat is good. It's okay to feel hungry. It's not like I'm going to die of it. Less food. No mystery here. Put. down. the. fork. Chew and swallow and enjoy some conversation along the way. Stop eating before you're full. So, nothing magic here. The boring truth is it's hard work and discipline. But the payoff is huge in feeling better, sleeping better, nicer skin, more energy . . . and let's be honest, new clothes! Can't wait for that part! So, tea breaks these days are almost only tea. Sometimes a small square of dark chocolate or a few nuts or a piece of fruit, but more often, just a cup of herbal tea with some stevia. 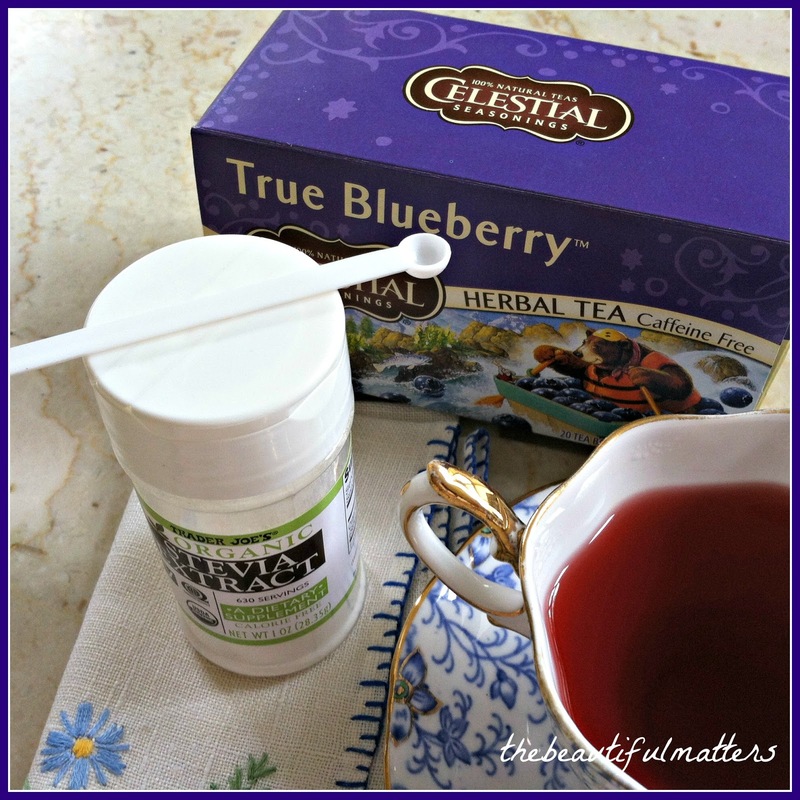 My favorite at the moment is Celestial Seasonings True Blueberry. A little stevia goes a long ways . . . isn't the little spoon too cute? And, picking up on something I said earlier, gratitude increases when we're not overindulging. I find I'm even more thankful for the good food I get to eat every day. When we come to the table hungry (and isn't that how it's supposed to be? ), good, honest, unprocessed food is a gift. We can truly say (and I'm only being a little funny here), "thank you, Lord, I get to have this food!" **Okay, a little hyperbole here, but really, cutting out these bad boys has been I think the single most important key to my losing weight. Well done you for losing your weight, slow and steady is the best way to lose it. To say I am proud of you and impressed and inspired - all understatements. Good going, lady - keep up the excellent disciplines. God bless today and always. Big sisterly hugs! Congrats on all the hard work and discipline! My husband is diabetic and I can tell I feel/sleep etc. much better IF I leave off sugar. I will have to try the blueberry tea. We've been enjoying a few fresh strawberries each afternoon with our tea. God bless you as you continue on your journey and enjoy those new clothes along the way! Hi Deborah and a BIG Congrats on the weight loss. You are amazing and so disciplined to get this far. I know it is hard work and you accomplished so much. Eating healthy does make all the difference. Best wishes as you go along to the finish. Sounds like you are nearly there. I so enjoyed reading your post. Congrats on your weight lost. Trust me I know just how you feel - it isn't easy. Keep up the wonderful work! Congratulations and all the best with losing the next seventeen pounds! Learning how to live within the confines of healthful eating is discipline and hard work for sure. You have done so well! Good for you, Deborah! You're right, it's about discipline. I'm using an app to track of my food and exercise and being accountable seems to be working for me. Having a treat once in awhile is good too, like your tea or piece of chocolate. Beauitful teacup btw. Congratulations on the weight loss. It can be so hard. Tea and chocolate are a great little treat. Love that teacup. Blue and white is always my favorite! Congratulations, Deborah! I have struggled all my life too and won't ever give up. I do love my healthy veggies and lean proteins....just like all the other stuff too! You have every right to be very pleased with yourself! That blueberry tea is awesome too! What a great message to read here and hats off to you for persevering and getting 25 pounds off! I'm struggling still to get one more pound on... My ideal weight is 52 kg or 114 lbs and I've been around 51 kg... and sometimes dizzy. Yes sure, emotional stress does pull us down but that's not a healthy way for losing any weight! You are right about the white flour and also all white pasta. Wishing you contintued good luck in achieving your goal and once again, I'm proud of you! Way to go, Deborah! Is it wonderful to fit in smaller sizes, isn't it? I remember feeling that way, too! Thankfully, I still fit in those sizes, after 15 years. Yes, moderation is the key! 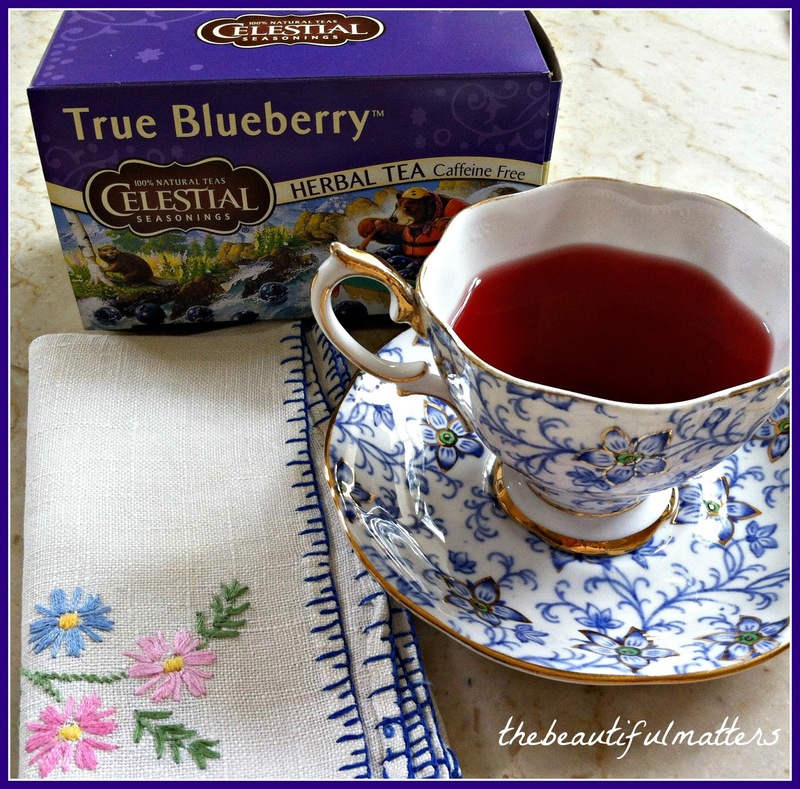 Your blueberry teatime is so pretty with your pretty teacup and embroidered napkin. Dark chocolate is such a treat! Moderation is the key and congrats on your weight loss! Your teacup is a beauty and tea tastes twice as good in it, I know. Such a pretty pattern. Thanks for sharing and for your sweet comment on my Memories post. Have a beautiful day, my friend. WOOHOO you're a STAR - I'm so proud of you my friend! 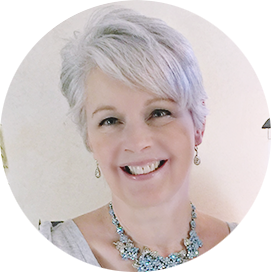 Blogging about your weight journey is a great way of keeping on track. Thanks to you, I'm on my way too, 3 kilos down and about 10 to go. I've got my fave skinny jeans hanging up where I can see them every day - they are good motivation for me! I'm enjoying a special tea too, it's Red Seal. Rhubarb & Strawberry. As yet I don't dare have dark chocolate in the house - my treat are the delicious fresh dates! I would appreciate any little tips or ideas that have helped you. What a great post - thank you my friend! Your post was beautifully written, Deborah. You shared many truths with us. Congratulations on the race you have been running this far, and may the Lord continue to sustain and guide you in the remainder of your desired goal. I like the way you described sugar, it's really not our friend, and I totally agree it has a dark side, just as white flour does. Your blueberry tea sounds very good, I must look for that. My favorite teas are the berry ones. And such a lovely tea cup to sip your tea in. 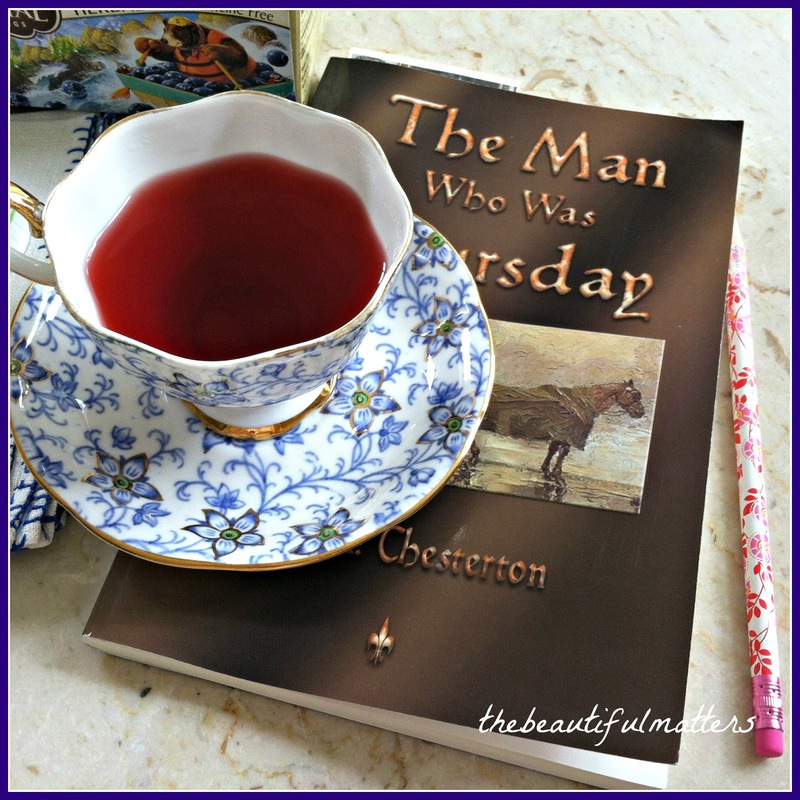 I'm new to your blog, but you captured my attention with that beautiful cup and saucer. This is such an inspirational post, I need to take heed...the older I get, the less will power I seem to have, ha. I also love that you rewrote those infamous words!! Congrats! Wow! Congratulations on such a great weight loss so far :) I too am in this struggle, and have had to admit that I can no longer eat poorly and get away with it. I've been dieting since mid-March ... and I've been hungry since, um, mid-March :[ Enjoying your tea in such a pretty teacup has got to help! I'm looking forward to buying new clothes too. Keep going!! O how wonderful and congratulations! Such hard work and effort...well done! The last few pounds will come off quickly. Congrats on your successful weight loss, Deborah! Your blue teacup is gorgeous! I am really proud of you! Bless you for hanging in there though the really tough times! Losing weight requires so much discipline, and the battle is first won in the mind, has been my experience. Congratulations on your weight loss. That's something to be proud of. Congrats on losing so much weight. That's just great & such an accomplishment and inspiration. Your teacup and tea looks so good. I do hope you feel good now and have fun shopping for new clothes. Take care. Huge congratulations are in order. It's so hard to lose weight but so much more so at our age. Your teacups are stunning, as always!! Wow! That is fantastic! What an accomplishment! You are right in the end...it comes down to putting less food in our mouths...hard as that may be. It is a constant struggle for most of us...me included. It is funny you wrote about the face collapsing. I had that happen. I started running and lost a fair amount of weight and then I looked about 10 years older! LOL Not what I was going for. It was in my 30's. Almost 20 years ago now. I decided to get some injections to offset the issue. It helped. I only got them once and either my perception of my face changed and I didn't feel I needed them anymore or my face settled. Either way I'm happy I don't need to have to keep going to back to get "topped up". Although now I might need something for the wrinkles! Debbie, you have so many good words of wisdom here. It's true! Feeling better, feeling healthy -- no food taste as good as that. Over-eating is UGH. It feels terrible. We only did it for taste, or out of habit, or for social reasons. And what you said about better skin -- isn't it true? I told Adam this also. His skin feels so much better since he lost that weight. May God continue to bless you in your goals for good health! Congratulations of your weight loss Deborah. I can just imagine how difficult it must have been but you were committed and determined and for that, you should be very proud. I am sure you feel wonderful after 25 pounds down. I do hope that you treat yourself during tea once in a while. 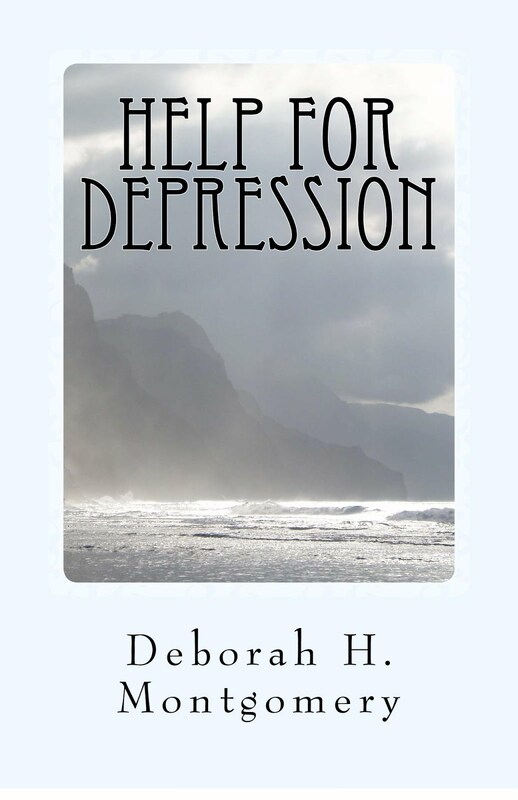 A huge congratulations to you, Deborah! Thank you for sharing the story of your weight loss journey with us. It's very inspiring! I need/want to lose 25 pounds, and your story has given me hope that I CAN do it. I need to exercise a bit more discipline than I have been doing! It's been forever since I've been by...in fact, since I've even logged in to my Blogger account. For awhile, I considered abandoning my blog altogether. I even deleted all my posts. But I have reconsidered and am going to start blogging again. I love connecting with all you beautiful gals too much to stay away any longer. Have a lovely day, and, again, congratulations!